In this special news report by Defencyclopedia, we bring you an analysis of the recent cruise missile attacks conducted by the Russian Navy, against targets in Syria. This article will provide a proper insight into what assets were involved in the strike. The US Navy’s amazing ability to launch hundreds of cruise missiles from its warships with great precision, is well-known and feared by its enemies. They have maintained the distinction of being the only Navy to launch long-range cruise missiles from surface ships, at land targets in combat (The Royal Navy has launched Tomahawk missiles from its submarines at land targets). But that’s changed as of October 7th 2015. We welcome the new entry into the short list, The Russian Navy! The following ships of the Russian Navy’s Caspian Sea flotilla, took part in this strike. This is a class of missile corvettes displacing just 950 tons, but still packs a powerful punch. It has the Positiv-M1.2 Active Phased Array radar as its primary sensor as well as the Anapa-M sonar suite. It is equipped with a 100 mm main gun and 8 vertical launch cells for the Klub family of cruise missiles. They were equipped with 8 Kalibr-NK cruise missiles for this particular mission. When they test fired the Kalibr-NK last year, nobody paid much attention as it was believed to be the 300 km range 3M54 Klub anti-ship missile. Since the cruise missile has a live warhead, most countries would object to it overflying their territory. 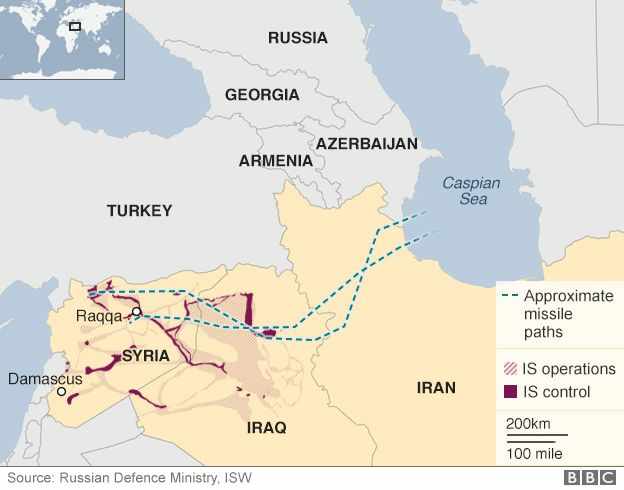 The Russian Navy launched these missiles from the Caspian Sea, which is separated from Syria by Iraq and Iran. Hence they had to obtain permission for the Kalibr missiles to overfly their territory to reach Syria. The map below shows the path followed by the missiles. The missile in focus here is one that most of you will be probably be hearing for the first time. Russian missiles like the Granit, Moskit, Yakhont, Klub etc are very popular. But a missile which is a part of the Klub family, the Kalibr-NK, was not highlighted anywhere. 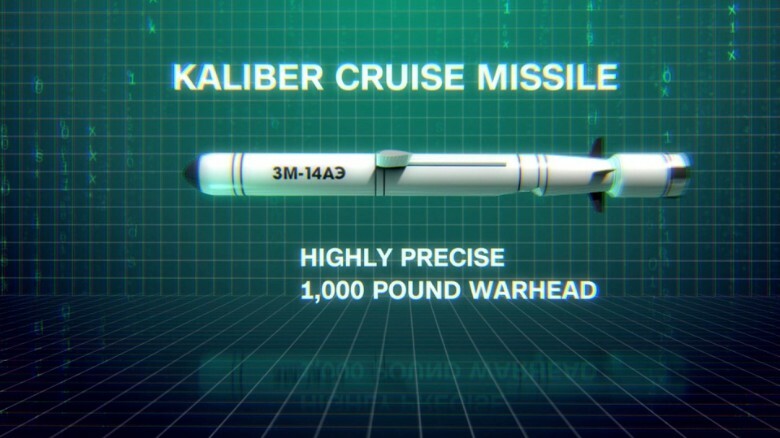 The 3M14 Kalibr is equivalent to the American Tomahawk cruise missile in many parameters such as range, warhead and propulsion. It has a 2500 km range, a 450 kg (1000 pound) high-explosive warhead and a turbofan engine. It is powered initially by a rocket booster, which launches it from the ship and allows the missile to attain cruise speed. Then the boosters fall off and the turbofan engine kicks in, the wings unfold and the missile cruises like an aircraft for the rest of its journey. It flies just 50 m above the ground, following way-points and navigating via satellite. The missiles were programmed to fly over isolated areas so as to not pose any threat to the civilian population of Iran and Iraq. The Russian Air Force has 2 functional air bases in Syria and their combat aircraft were based close to the targets attacked by the cruise missiles. So why didn’t they use their aircraft instead? Why did they have to waste expensive cruise missiles on a target which could be destroyed by a few inexpensive bombs ? It was never about hitting the target in the most cost-effective manner. It was all about sending a message to the US, that the Russian Navy has the capability to attack targets thousands of kilometers away using cruise missiles. Also by sending their smallest warships to launch these powerful missiles, they wanted to show that even their 1000 ton ships pack a very powerful punch and shouldn’t be discounted as insignificant. So does it mean that Russia has land attack capability the US Navy? No. A single US Navy Arleigh Burke class destroyer can carry 96 Tomahawk cruise missiles if required, whereas Russia has around 8-10 warships that can carry 8 Kalibr missiles each. Since the US Navy has over 60 such destroyers, their land attack capability is 60 times greater than Russia’s. Interestingly, Russia doesn’t have a single destroyer in service which can carry the Kalibr-NK missile. This means that Russia’s power projection ability is limited to its immediate surroundings. These images have been obtained from the official video released by the Russian Ministry of Defense. The pictures have been labeled in numerical order. The launching of these cruise missiles validates the capabilities of the Russian Navy. It also shows that Russia will no longer be a spectator in global events and is ready to get involved militarily. The war in Syria is also a perfect opporunity for Russa to test its untested arsenal in combat and see how they hold up in the real situations. So far it has proven to be fruitful as Russia has deployed their latest and most modern assets which are currently undergoing their acid test in combat. The situation is not expected to improve anytime soon and we will keep you updated with similar reports about significant events. In my opinion, after that spectacular show. I think their will be plenty of countries who will be lining up at the door of Putin’s house asking to buy the Gepard class Frigate and Buyan M Class Corvette with Klub family Cruise missile. I would give 6 months to a year and you will see sales skyrocket on Klub family cruise missiles, Gepard class Frigates and Buyan M class Corvettes. If those claims by CNN are correct, that 4 missiles crashed in Iran, then the sales you mentioned are not going to go very well after all. Not sure thought, it could just media propaganda. Both Iran and Russia denied the fact. Does anyone believe the Western mainstream media? No proof, no information from the Pentgram. Launch 26 salvo of missiles, and 4 of them failed and landed in iran. as usual with MSM , the source of that 4 failed missiles are all anonymous , which is by today’s standard , enough evidence to the joe public in western world..
btw , tomahawk have high success rate, except when it hit the chinese embassy in belgrade… by ‘mistake’ .. lol … intentional mistake ? The Chinese embassy was hit by JDAMs not Tomahawks! And the JDAMs did hit the selected target as you indicated. What the targeteers did not know is that the building was an embassy. Very interesting and enjoyable article. My gut feeling is that Moscow`s primary objectives with the Syria campaign is to show off and get to test their newest assets. That’s their secondary objective. Their primary objective is to protect their naval and air bases from being taken over. Hmeimim is none but the former name of Lattakia airbase. Yes. I realized it afterwards. I apologize for the error. But Russia does have 2 air bases in Syria. Very few people expected that Russia will join this conflict, the article was nice by the way. India is going to purchase S-400 missile system from Russia. Recently, China and Iran also purchased similar systems i.e., S-400 and S-300 respectievly. I hope we will see an article on this soon. Thank you. I will surely do an article on the S400. nice article , same like previous articles. Request to you, write 1 article on Russia’s top 10 military weapons. Thank you. That’s a nice coincidence because i am writing that article at present. Will be published soon. Superb analysis. I am regular visitor to your site and the graphics & insights always enthrall me. Keep up the good work N.R.P. Do we know for sure they were fired from the Caspian sea? Is it because Russia said so? Yes we know for sure. It was announced by the Russian govt. Previous PostPrevious News Digest : Russia sends Su-30s to Syria, Egypt buys 2 Mistrals..